The fundamental question that Kautsky discusses in his pamphlet is that of the root content of proletarian revolution, namely, the dictatorship of the proletariat. This is a question that is of the greatest importance for all countries, especially for the advanced ones, especially for the belligerent countries, and especially at the present time. One may say without fear of exaggeration that this is the most important problem of the entire proletarian class struggle. Hence it is necessary to deal with it with particular attention. 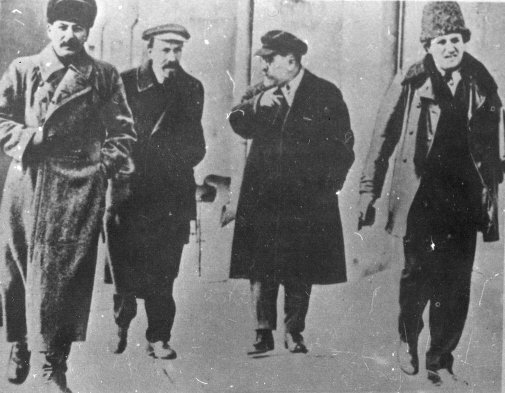 Let us point out, in passing, that when calling the non-Bolsheviks in Russia, i.e., the Mensheviks and Socialist-Revolutionaries, Socialists, Kautsky was guided by their appellation, that is, by a word, and not by the actual place they are occupying in the struggle between the proletariat and the bourgeoisie. What an excellent understanding and application of Marxism! But of this more anon. At present we must deal with the main point, viz., with Kautsky's great discovery of the "fundamental contrast" between the "democratic and dictatorial methods." That is the crux of the matter; that is the essence of Kautsky's pamphlet. And that is such a monstrous theoretical muddle, such a complete renunciation of Marxism, that Kautsky, it must be confessed, has far excelled Bernstein. The question of the dictatorship of the proletariat is a question of the relation of the proletarian state to the bourgeois state, of proletarian democracy to bourgeois democracy. One would think that this is as plain as noonday. But Kautsky, like a schoolmaster who has become as dry as dust from repeating the same old textbooks on history, persistently turns his back on the twentieth century and his face to the eighteenth century, and for the hundredth time, in a number of paragraphs, incredibly tediously chews the old cud over the relation of bourgeois democracy to absolutism and medievalism! It sounds indeed as if he were chewing rags in his sleep! But this means that he utterly fails to understand what is what! One cannot help smiling at Kautsky's efforts to make it appear that there are people who preach "contempt for democracy" (p. 11) and so forth. It is by such twaddle that ( Kautsky finds himself compelled to befog and confuse the issue, for he poses it in the manner of the liberals, speaks of democracy in general, and not of bourgeois democracy; he even avoids using this precise, class term, and, instead, tries to speak about "pre-socialist" democracy. This windbag devotes almost one-third of his pamphlet, twenty pages out of a total of sixty-three, to this twaddle, which is so agreeable to the bourgeoisie, for it is tantamount to embellishing bour-geois democracy, and obscures the question of the proletarian revolution. But, after all, the title of Kautsky's pamphlet is The Dictatorship of the Proletariat. Everybody knows that this is the very essence of Marx's doctrine; and after a lot of irrelevant twaddle Kautsky was obliged to quote Marx's words on the dictatorship of the proletariat. "This view" (which Kautsky dubs "contempt for democracy") "rests upon a single word of Karl Marx's." This is what Kautsky literally says on page 20. And on page 60 the same thing is repeated even in the form that they (the Bolsheviks) "opportunely recalled the little word" (that is literally what he says -- des Wörtchens!!) "about the dictatorship of the proletariat which Marx once used in 1875 in a letter." "Between capitalist and communist society lies the period of the revolutionary transformation of the one into the other. There corresponds to this also a political transition period in which the state can be nothing but the revolutionary dictatorship of the proletariat." First of all, to call this celebrated proposition of Marx's, which sums up the whole of his revolutionary teaching, "a single word" and even "a little word," is an insult to and complete renunciation of Marxism. It must not be forgotten that Kautsky knows Marx almost by heart, and, judging by all he has written, he has in his desk, or in his head, a number of pigeonholes in which all that was ever written by Marx is most carefully filed so as to be ready at hand for quotation. Kautsky cannot but know that both Marx and Engels, in their letters as well as in their published works, repeatedly spoke about the dictatorship of the proletariat, before and especially after the Paris Commune. Kautsky cannot but know that the formula "dictatorship of the proletariat" is merely a more historically concrete and scientifically exact formulation of the proletariat's task of "smashing" the bourgeois state machine, about which both Marx and Engels, in summing up the experience of the Revolution of 1848, and, still more so, of 1871, spoke for forty years, between 1852 and 1891. How is this monstrous distortion of Marxism by that Marxist textualist Kautsky to be explained? As far as the philosophical roots of this phenomenon are concerned, it amounts to the substitution of eclecticism and sophistry for dialectics. Kautsky is a past master in this sort of substitution. Regarded from the standpoint of practical politics, it amounts to subserviency to the opportunists, that is, in the last analysis to the bourgeoisie. Since the outbreak of the war, Kautsky has made increasingly rapid progress in this art of being a Marxist in words and a lackey of the bourgeoisie in deeds, until he has become a virtuoso in it. "Marx, unfortunately, neglected to show us in greater detail how he conceived this dictatorship.". . . (This is the utterly mendacious phrase of a renegade, for Marx and Engels gave us, indeed, quite a number of most detailed indications, which Kautsky, the Marxist textualist, has deliberately ignored.) "Literally, the word dictatorship means the abolition of democracy. But, of course, taken literally, this word also means the undivided rule of a single person unrestricted by any laws -- an autocracy, which differs from despotism only in the fact that it is not regarded as a permanent state institution, but as a transient emergency measure. "The term, 'dictatorship of the proletariat,' hence not the dictatorship of a single individual, but of a class, ipso facto precludes the possibilitythat Marx in this connection had in mind a dictatorship in the literal sense of the term. We have deliberately quoted this argument in full in order that the reader may clearly see the methods Kautsky the "theoretician" employs. Kautsky chose to approach the question in such a way as to begin with a definition of the "word" dictatorship. Very well. Everyone has a sacred right to approach a question in whatever way he pleases. One must only distinguish a serious and honest approach from a dishonest one. Anyone who wanted to be serious in approaching the question in this way ought to have given his own definition of the "word." Then the question would have been put fairly and squarely. But Kautsky does not do that. "Literally," he writes, "the word dictatorship means the abolition of democracy." In the first place, this is not a definition. If Kautsky wanted to avoid giving a definition of the concept dictatorship, why did he choose this particular approach to the question? Secondly, it is obviously wrong. It is natural for a liberal to speak of "democracy" in general; but a Marxist will never forget to ask: "for what class?" Everyone knows, for instance (and Kautsky the "historian" knows it too), that rebellions, or even strong ferment, among the slaves in antique times at once revealed the fact that the antique state was essentially a dictatorship of the slaveowners. Did this dictatorship abolish democracy among, and for, the slaveowners? Everybody knows that it did not. Kautsky the "Marxist" said this monstrously absurd and untrue thing because he "forgot" the class struggle. . . . 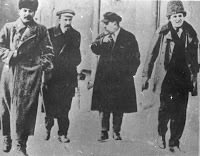 In order to transform Kautsky's liberal and false assertion into a Marxian and true one, one must say: dictatorship does not necessarily mean the abolition of democracy for the class that exercises the dictatorship over the other classes; but it necessarily does mean the abolition (or very material restriction, which is also a form of abolition) of democracy for the class over which, or against which, the dictatorship is exercised. But, however true this assertion may be, it does not give a definition of dictatorship. ". . . But, of course, taken literally, this word also means the undivided rule of a single person unrestricted by any laws." Like a blind puppy casually sniffing first in one direction and then in another, Kautsky accidentally stumbled upon one true idea (namely, that dictatorship is rule unrestricted by any laws), nevertheless, he failed to give a definition of dictatorship, and, moreover, he gave vent to an obvious historical falsehood, viz., that dictatorship means the rule of a single person. This is even grammatically incorrect, since dictatorship may also be exercised by a handful of persons, or by an oligarchy, or by a class, etc. Kautsky then goes on to point out the difference between dictatorship and despotism, but, although what he says is obviously incorrect, we shall not dwell upon it, as it is wholly irrelevant to the question that interests us. Everyone knows Kautsky's inclination to turn from the twentieth century to the eighteenth, and from the eighteenth century to classical antiquity, and we hope that the German proletariat, after it has attained its dictatorship, will bear this inclination of his in mind and appoint him, say, teacher of ancient history at some high school. To try to evade a definition of the dictatorship of the proletariat by philosophizing about despotism is either crass stupidity or very clumsy trickery. Dictatorship is rule based directly upon force and unrestricted by any laws. The revolutionary dictatorship of the proletariat is rule won and maintained by the use of violence by the proletariat against the bourgeoisie, rule that is unrestricted by any laws. And this simple truth, a truth that is as plain as noonday to every class-conscious worker (who represents the masses, and not an upper stratum of petty-bourgeois scoundrels who have been bribed by the capitalists, such as are the social-imperialists of all countries), this truth, which is obvious to every representative of the exploited classes that are fighting for their emancipation, this truth, which is beyond dispute for every Marxist, has to be "extracted by main force" from the most learned M. Kautsky! How is it to be explained? Simply by that spirit of servility with which the leaders of the Second International, who have become contemptible sycophants in the service of the bourgeoisie, are imbued. Kautsky first committed a sleight of hand by proclaiming the obvious nonsense that the word dictatorship, in its literal sense, means the dictatorship of a single person, and then -- on the strength of this sleight of hand I -- he declared that "hence" Marx's words about the dictatorship of a class were not meant in the literal sense (but in one in which dictatorship does not imply revolutionary violence, but the "peaceful" winning of a majority under bourgeois -- mark you -- "democracy"). One must, if you please, distinguish between a "condition" and a "form of government." A wonderfully profound distinction; it is like drawing a distinction between the "condition" of stupidity of a man who reasons foolishly and the "form" of his stupidity. Kautsky finds it necessary to interpret dictatorship as a "condition of rulership" (this is the literal expression he uses on the very next page, p. 21), because then revolutionary violence, and violent revolution, disappear. The "condition of rulership" is a condition in which any majority finds itself under . . . "democracy"! Thanks to such a fraudulent trick, revolution happily disappears ! But the trick is too crude and will not save Kautsky. One cannot hide the fact that dictatorship presupposes and implies a "condition," one so disagreeable to renegades, of revolutionary violence of one class against another. The absurdity of drawing a distinction between a "condition" and a "form of government" becomes patent. To speak of forms of government in this connection is trebly stupid, for every schoolboy knows that monarchy and republic are two different forms of government. It must be explained to Mr. Kautsky that both these forms of government, like all transitional "forms of government" under capitalism, are but varieties of the bourgeois state, that is, of the dictatorship of the bourgeoisie. Lastly, to speak of forms of government is not only a stupid, but also a very crude falsification of Marx, who was very clearly speaking here of this or that form or type of state, and not of forms of government. The proletarian revolution is impossible without the forcible destruction of the bourgeois state machine and the substitution for it of a new one which, in the words of Engels, is "no longer a state in the proper sense of the word." But Kautsky finds it necessary to befog and belie all this -- his renegade position demands it. See to what wretched subterfuges he resorts. First subterfuge. . . . "That Marx in this case did not have in mind a form of government is proved by the fact that he was of the opinion that in England and America a peaceful revolution was possible, i.e., by democratic means." The form of government has absolutely nothing to do with the case here, for there are monarchies which are not typical of the bourgeois state, such, for instance, as have no military clique, and there are republics which are quite typical in this respect, such, for instance, as have a military clique and a bureaucracy. This is a universally known historical and political fact, and Kautsky will not succeed in falsifying it. If Kautsky had wanted to argue in a serious and honest manner he would have asked himself: are there historical laws relating to revolution which know of no exception? And the reply would have been: no, there are no such laws. Such laws only apply to the typical, to what Marx once termed the "ideal," meaning average, normal, typical capitalism. Further, was there in the seventies anything which made England and America exceptional in regard to what we are now discussing? It will be obvious to anyone at all familiar with the requirements of science in regard to the problems of history that this question must be put. To fail to put it is tantamount to falsifying science, to engaging in sophistry. And, the question having been put, there can be no doubt as to the reply: the revolutionary dictatorship of the proletariat is violence against the bourgeoisie; and the necessity of such violence is particularly created, as Marx and Engels have repeatedly explained in detail (especially in The Civil War in Franceand in the preface to it), by the existence of a military clique and a bureaucracy. But it is precisely these institutions that were n o n - e x i s t e n t precisely in England and in America and precisely in the 1870's, when Marx made his observations (they do exist in England and in America now)! Kautsky has to resort to trickery literally at every step to cover up his apostasy! And note how he inadvertently betrayed the cloven hoof; he wrote: "peacefully, that is, in a democratic way"!! In defining dictatorship, Kautsky tried his utmost to conceal from the reader the fundamental feature of this concept, namely, revolutionary violence. But now the truth is out: it is a question of the contrast between peaceful and violent revolutions. That is where the trouble lies. Kautsky had to resort to all these subterfuges, sophistries and fraudulent falsifications only in order to dissociate himself from violent revolution, and to conceal his renunciation of it, his desertion to the liberal labour policy, i.e., to the bourgeoisie. That is where the trouble lies. Kautsky the "historian" so shamelessly falsifies history that he "forgets" the fundamental fact that pre-monopoly capitalism -- which reached its zenith actually 1870's -- was by virtue of its fundamental economic traits, which found most typical expression in England and in America, distinguished by a, relatively-speaking, maximum fondness for peace and freedom. Imperialism, on the other hand, i.e., monopoly capitalism, which finally matured only in the twentieth century, is, by virtue of its fundamental economic traits, distinguished by a minimum fondness for peace and freedom, and by a maximum and universal development of militarism. To "fail to notice" this in discussing the extent to which a peaceful or violent revolution is typical or probable is to stoop to the position of a most ordinary lackey of the bourgeoisie. Second subterfuge: The Paris Commune is a dictatorship of the proletariat, but it was elected by universal suffrage, i.e., without depriving the bourgeoisie of the franchise, i.e., "democratically." And Kautsky says triumphantly: ". . . The dictatorship of the proletariat was for Marx" (or: according to Marx) "a condition which necessarily follows from pure democracy, if the proletariat forms the majority" (bei überwiegendem Proletariat, S. 21). This argument of Kautsky's is so amusing that one truly suffers from a veritable embarras de richesses (an embarrassment due to the wealth . . . of replies that can be made to it). Firstly, it is well known that the flower, the General Staff, the upper strata of the bourgeoisie had fled from Paris to Versailles. In Versailles there was the "Socialist" Louis Blanc -- which, by the way, proves the falsity of Kautsky's assertion that "all trends" of Socialism took part in the Paris Commune. Is it not ridiculous to represent the division of the inhabitants of Paris into two belligerent camps, one of which gathered the entire militant and politically active section of the bourgeoisie, as "pure democracy" with "universal suffrage"? Secondly, the Paris Commune waged war against Versailles as the workers' government of France against the bourgeois government. What has "pure democracy" and "universal suffrage" got to do with it, when Paris was deciding the fate of France? When Marx expressed the opinion that the Paris Commune had committed a mistake in failing to seize the bank, which belonged to the whole of France, did he proceed from the principles and practice of "pure democracy"? Really, it was obvious that Kautsky was writing in a country where the people are forbidden by the police to laugh "in crowds," otherwise Kautsky would have been killed by ridicule. "Have these gentlemen" (the anti-authoritarians) "ever seen a revolution? A revolution is certainly the most authoritarian thing there is; it is the act whereby one part of the population imposes its will upon the other part by means of rifles, bayonets and cannon -- authoritarian means, if such there be at all; and if the victorious party does not want to have fought in vain, it must maintain this rule by means of the terror which its arms inspire in the reactionaries. Would the Paris Commune have lasted a single day if it had not made use of this authority of the armed people against the bourgeois? Should we not, on the contrary, reproach it for not having used it freely enough?" Here you have your "pure democracy"! How Engels would have ridiculed the vulgar petty bourgeois, the "Social Democrat" (in the French sense of the 'forties and the general European sense of 1914-18), who took it into his head to talk about "pure democracy" in a society divided into classes! But enough. It is impossible to enumerate all the various absurdities Kautsky goes to the length of, since every phrase he utters is a bottomless pit of apostasy. Marx and Engels analyzed the Paris Commune in a most detailed manner and showed that its merit lies in its attempt to smash, to break up the "ready-made state machinery." Marx and Engels considered this condition to be so important that this was the o n l y amendment they introduced in 1872 in the "obsolete" (in parts) program of the Communist Manifesto. Marx and Engels showed that the Paris Commune had abolished the army and the bureaucracy, had abolished parliamentarism, had destroyed "that parasitic excrescence, the state," etc. ; but the sage Kautsky, donning his nightcap, repeats the fairy tale about "pure democracy," which has been told a thousand times by liberal professors. Not without reason did Rosa Luxemburg declare, on August 4, 1914, that German Social-Democracy was now a stinking corpse. Third subterfuge: "When we speak of the dictatorship as a form of government we cannot speak of the dictatorship of a class, since a class, as we have already pointed out, can only rule but not govern. . . ." It is "organizations" or "parties" that govern. That is a muddle, a disgusting muddle, Mr. "Muddle Counsellor"! Dictatorship is not a "form of government"; that is ridiculous nonsense. And Marx does not speak of the "form of government" but of the form or type of state. That is something altogether different, altogether different. It is altogether wrong, too, to say that a class cannot govern: such an absurdity could only have been uttered by a "parlia-mentary cretin," who sees nothing but bourgeois parliaments and notices nothing but "ruling parties." Any European country will provide Kautsky with examples of government by a ruling class, for instance, by the landlords in the Middle Ages, in spite of their insufficient organization. To sum up: Kautsky has in a most unparalleled manner distorted the concept dictatorship of the proletariat, and has transformed Marx into an ordinary liberal; that is, he himself has sunk to the level of a liberal who utters banal phrases about "pure democracy," embellishing and glossing over the class content of bourgeois democracy, and shrinking, above all, from the use of revolutionary violence by the oppressed class. By so "interpreting" the concept "revolutionary dictatorship of the proletariat" as to expunge the revolutionary violence of the oppressed class against its oppressors, Kautsky beat the world record in the liberal distortion of Marx. The renegade Bernstein has proved to be a mere puppy compared with the renegade Kautsky.